Pisco is a strong, colorless, grape brandy from Peru & Chile. It means “little bird” in the native Quecha language. Pisco was first developed by Spanish settlers in the 16th century. Orujo (a pomace brandy) was being imported from Spain and it was very expensive. Pisco was the alternative and the solution. It originated in a province called Pisco in Peru. All of the vines used in production were imported by Spanish ships from the Canary Islands. The grapes were first planted in coastal valleys in the Vice Royalty of Peru around 1563. Pisco (the area) is located in the Ica region, which borders the Pacific Ocean. It’s formed by coastal plains and two of the largest rivers in Peru, the Pasco and Ica. The Spanish first settled in Pisco due to its prime location along the coast. More settlers joined the ships and it grew into a large shipping export and import area. The Spanish had grapevines brought in from the Canary Islands because they wanted to grow grapes to produce wine. All of the grapes that were considered acceptable to use in wine production were kept. The left over grapes were given to local farmers to do as they wished. Farmers decided to use the grapes and make a distilled brandy. As more and more Spanish ships and sailors arrived in Ica, they wanted something affordable that they could drink. Pisco was cheap and basically everyone could afford it. The nobles, local generals and ships captains all drank whisk(e)y, but the regular deck hands and sailors were broke. They all found a libation called “Pisco”. Ships started to export Pisco and soon it almost equalled wine as an export. Pisco continued to grow in popularity until the explosion and influence of Rum. Production of Pisco began to explode soon after sailors started drinking it. Around 1613 the first written documentation on distillation was released in Peru. The documents included everything needed to produce Pisco. This early style of Pisco is believed to have been of the Quebranta variety. To this date there are several different styles and brands of Pisco, which I will go into later. Pisco made in Chile was first recognized in 1871. Its Appellation of Origin became official law in 1931. Designated Pisco areas in Chile are Atacama and Coquimbo. It was introduced in the Elqui Valley which winds up and down the Andes Mountain range. The location and soil make it ideal for grape growing. Pisco production has been restricted to only 3 varieties of grapes in Chile. They are: Muscat, Torontel and Pedro Ximenez (also used in a style of Sherry). The grapes are fermented and double distilled in copper pot stills. The grape juice from the grapes is fermented into a wine containing 14% alcohol. The fermented product is distilled in copper vessels until it reaches 55-60 proof. If it is low in proof, rectifiers are added to increase it. Pisco is then aged in wood for a few months. If it’s a high quality Pisco, it will be aged longer in the wood. Liquor from different distilleries are mixed and diluted with demineralized water to lower the proof to desired qualifications, then it’s filtered and bottled. Regular – 30-35% ABV (60-70 proof). This style is sweet and woody tasting. Traditionally it is mixed with a little water. Special – 35-40% ABV (70-80 proof). Sweet tasting with a warm and strong alcohol taste. Control – 40% ABV (80 proof). This style is aged in oak barrels. Reserve – 40-43% ABV (80-86 proof). Like the Special, it is sweet in taste with a warm, alcohol after taste. Great – 43% ABV or more (86 proof and greater). Dark yellow in color due to wood aging, with strong woody flavor. Grapes used in production of Chilean Pisco are: Yellow Muscat, White Early Muscat, Alexandria Muscat, Austrian Muscat, Frontigan Muscat, Hamburg Muscat, Black Muscat, Pink Muscat, Canelli Muscat, Orange Muscat, Pedro Ximenez and Torontel. The alcohol content in the styles of Pisco will range from 30-50% ABV (60-100 proof). Production of Peruvian Pisco can be done with partial or total maceration of the grape. Temperature and decomposition of the sugars are strictly controlled. Pisco made in Peru is distilled using freshly fermented grape juice in copper pot stills or stainless steel vessels to the desired proof. It is never diluted after distillation. This is called bottle or barrel strength. During distillation, the “heads” or first part of the distillate are kept and are mixed with the rest of the distillate (Second Distillation). Adding the heads to the second distillation adds more character and keeps in with the Peruvian distillation traditions. Designated areas of origin to make Pisco in Peru are: The Departments of Lima, Ica and its Provinces (Ica, Pisco, Chinchay), Arequipa, Moquegua and the Locumbo, Sama and the Cuplina Valleys in the Department of Tacna. Pure – Made from a single style of grape. It can either be Quebranta, Mollar or the Common Black grape. No blending of any kind is allowed. This is a viscous and smooth tasting Pisco. Peruvian tradition is to drink it neat. Aromatic – Made from either Muscat or some sort of Muscat derived grape (Albilla, Italia or Torontel). Only one style of grape is allowed in production. Normally this style is made from Italy or Muscat grapes. It is rested in large clay pots called “botijas”. Mosto Verde – This means “Green Must”. This is distilled from a partially fermented must. It must be distilled before the fermentation process has completely converted sugars into alcohol. Usually this style is seen in higher income areas. It has a very floral nose and fruity taste to it due to early distillation. 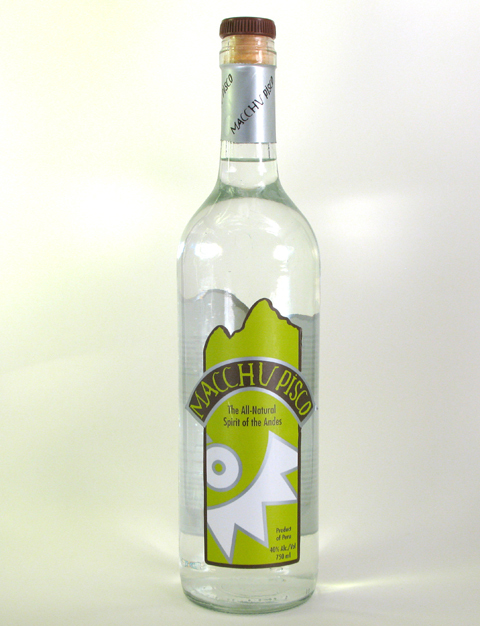 Acholado – This is a “half-breed” style of Pisco. It’s blended from the must of several varieties of grapes. A sweeter smelling and tasting style of Pisco. Grapes used in Non-Aromatic styles of Pisco are: Quebranta, Common Black, Mollar or Uvina. Aromatic styles include: Italia, Muscat, Albilla and Torontel. Alcohol content in the styles of Pisco in Peru will range from 38-48% ABV (76-96 proof). Pisco must be aged a minimum of 3 months in either glass, stainless steel or any other style of material that will not alter the physical, chemical or organic property of the spirit. Nothing can be added to the distillate that will alter its flavor, odor, appearance or alcoholic proof. In Peru it is illegal to sell and import Chilean “Pisco”. Any style of Cane Brand product is prohibited to be imported or introduced to a viticulture area of Pisco. In the 1990’s, the International Organization of Vine & Wine (OIV) declared that “Pisco” was a common Appellation of Chile and Peru. The OIV has called on both countries to work together, settle their differences and forge ahead to improve Pisco’s commercialism and international spread. Peru: Liquor obtained exclusively from distillation of recently fermented “grapes” using methods which maintain the traditional principles of quality established in recognized production areas. Chile: Reserved to liquor produced and bottled in consumable quantities in region III and IV, elaborated by the distillation of genuine wine, originating from specified varietals grown in said regions.